Coloration varies from yellowish brown to a dark reddish brown with a grizzled effect due to the lighter tips of the hair. They have a stout body with a broad flat head and eyes located near the top. The location of the eyes enables the animal to look out of his burrow for danger without exposing much of his body. That habit often frustrates the hunter. Woodchucks are one of the few game animals that pursued during the summer and into the fall. Many of the skills, and much of the tackle, necessary to take woodchuck hunting the same as required for hunting deer. To begin, one needs a bow of hunting weight (40 pounds or greater pull), a full camouflage suit with face mask or camouflage make‑up, and hunting arrows with broadheads. The broadhead must be sharp. The hunter must be able to stalk without detection and must be able to shoot accurately at a spot on an animal. Many beginning bowhunters make the mistake of shooting at the whole animal and not a spot. If one can shoot at the kill zone on a woodchuck, it is even easier to find the kill zone on the larger deer. Another piece of equipment is the spotting scope or binoculars. With the aid of optics such as binoculars or spotting scopes, one can identify a chuck in a field and plan the stalk. Optics save the hunter from having to walk a lot when hunting. If a field does not have sign of woodchuck activity through a spotting scope, then there is little sense in stalking all over it. Wood chucks are particularly wary animals. The bow is a silent weapon but the woodchuck shot at and missed makes quick haste to the safety of his den. Usually he will stay there for a long time. If one uses a turkey call softly, they will come back up to see what is happening. Often they will come clear out of the den. No one seems to know why this technique works, it just does. Woodchuck dens are often on a hillside with good drainage. The mouth of the den is generally about a foot in diameter and is in the root system of a large tree or under a rock. That makes it more difficult for a predator to dig into the burrow. Often the mouth of the burrow will face the rising sun to catch the warming morning rays. 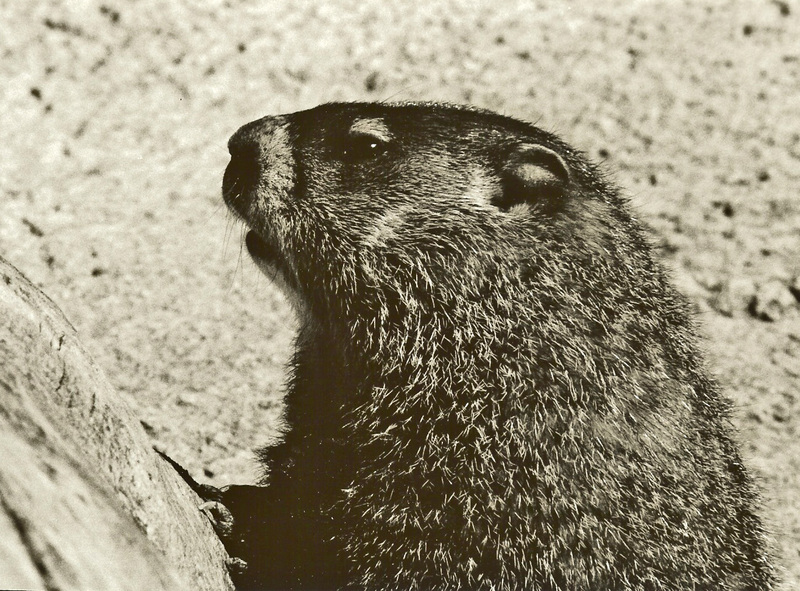 Woodchucks seldom stray more than 100 feet from the mouth of the den except during the breeding season. By late the summer, their trails to the den site are rather pronounced. They use then to go to and from feeding areas in the early morning and late afternoon. During mid-day they stay near the den entrance. During the daylight hours, they tend to stay in the cool protection of the den. The exception to this practice seems to be just after a rain or on a cloudy day. They then will active almost any time. Being creatures of the edges, woodchucks often locate their dens in hedge rows with trees or on the edge of a wood lot that is next to a meadow or grain field. They feed on such plant life as alfalfa, clover, and soybeans. They are not popular with farmers. Their favorite foods are dandelion and plantain. A woodchuck’s fondness for grain crops helps the hunter find landowners willing to allow hunting. A woodchuck will sit in a field and shear off young grain plants, and sitting upright, eat them while watching for danger. They prefer to feed uphill from their den entrance so that they can run downhill to the safety of the den. Woodchucks are an interesting and challenging quarry. They provide a bowhunter with some hunting between the spring turkey season and summer squirrel season. Hunting woodchucks sounds like a good alternative from urban living. i’d like to know if woodchucks have any natural predators and if there are state laws about legal woodchuck sizes when hunting for one? Not sure about MO but think there is a season. There is here in IL. Most any predator will go after Woodchucks including domestic dogs. Man too because they make great eating.